The hottest news in the ski world is the long awaited creation of a link between the Lech-Zurs and Sankt Anton am Arlberg, cradle of Alpine skiing. Ski Arlberg just announced that the cableway will open in November 2016. In total four high-speed, ten-seater gondolas have been built to link Lech, Zürs, Stuben, St. Christoph, St. Anton and Schröcken Warth, forming Austria’s largest continuous ski resort with 87 railways and lifts and 305 km of ski pistes. From Zürs, the Trittkopfbahn I leads to the new intermediate station, from where skiers may either continue to the new top station of Trittkopfbahn II or use the new Flexenbahn to carry on to Alpe Rauz in Stuben. From here, the other new cableway, Albonabahn II, will invite skiers to continue to Stuben. 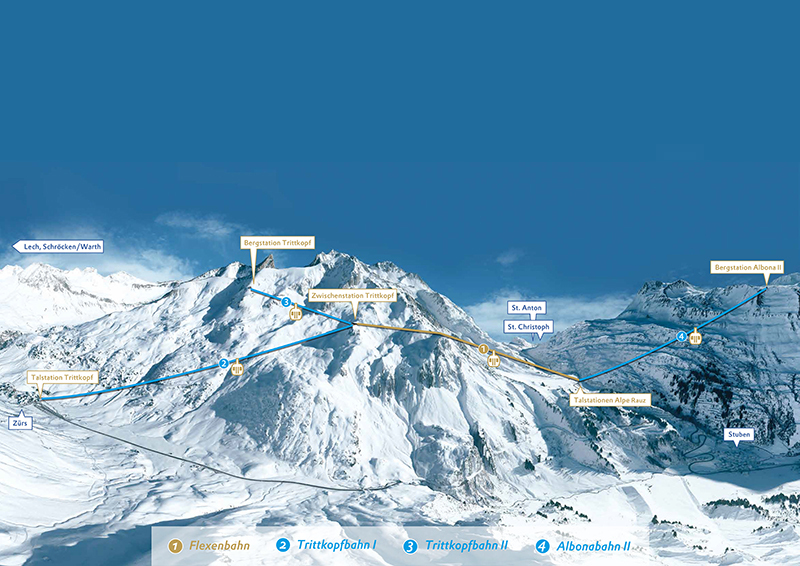 In addition, skiers starting out from Alpe Rauz can conveniently explore the St. Christoph and St. Anton skiing areas. This means that all resorts of the Arlberg skiing area – St. Anton and St. Christoph, Stuben, Zürs, Lech, Oberlech as well as Schröcken and Warth – will be easily and comfortably accessible on skis. The cableway runs high above Flexenpassstraße road, covering a distance of almost 1.8 kilometres and an altitude difference of over 562 metres. The cableway consists of 47 cabins for 10 persons each. This means that, with a travel time of about 6 minutes, the cableway can transport up to 2400 persons per hour. Each of the comfortable cabins has large panorama panes, offering an unobstructed view into the Klostertal valley and towards the Arlberg pass/St. Christoph. Enjoy the breath-taking landscape before hitting the next ski run. The Arlberg is a major ski region, but this new series of connections makes it one of the largest in the world, overtaking the French regions of Val d’Isère/Tignes Espace Killy and Grand Massif. 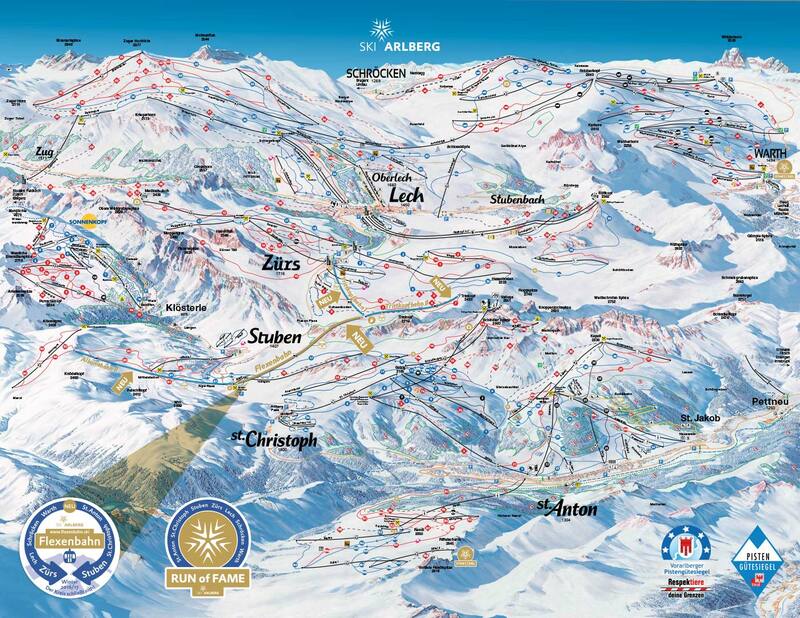 The new Arlberg’s exact size ranking is a little uncertain, since some of the claims of the larger ski areas around the world are disputed. The Flexenbahn is not just a plus for skiers, but also for the environment. It will reduce bus traffic between Zürs and Rauz by 120 trips a day and cut the number of cars in the villages, as more skiers use Rauz for their park & ride.